USANA, word! : Game. Set. Match. Did you know that USANA is the Official Health Supplement Supplier for the Women’s Tennis Association (WTA) and USANA EssentialsTM has been the Official Multivitamin of the WTA since 2006? For any top competitor, optimal health could mean the difference between a Grand Slam Championship and a first-round ext. That's why over 165 WTA players trust their health to USANA. A new tennis season kicks off in Australia and New Zealand in January and USANA will be there to support our WTA players in both cities! The ASB Classic starts January 2 in Auckland and features USANA ambassador Zheng Jie and other well known names such as Venus Williams and Jelena Dokic. USANA will be hosting an exhibition booth in the “Fan Zone” area so make sure you come down and check us out! The Sydney Apia International starts on January 8 at Sydney Olympic Park and features our very own Sam Stosur, ready to back up from her recent US Open Grand Slam win! The Sydney International features a stunning line up of female players with nine of the top 10 scheduled to participate! 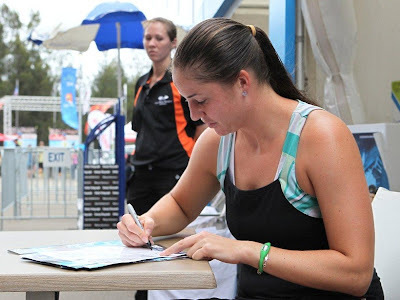 The Sydney booth will feature a prize wheel where tennis fans have the chance to win some great prizes including instant wins such as USANA products, to entries to the daily major prize draw – a 6 month supply of USANA EssentialsTM – that’s over $4,000 worth of product up for grabs! So if you’re looking for something fun and exciting during these school holidays, grab the kids and get down to Sydney Olympic Park between 8 – 14 January for some world-class tennis action and don't forget to stop by the USANA booth and say hi! Here are a few pictures from the USANA booth in 2011! Our booth in 2011 attracted lots of tennis fans with their chance to win a game on the Nintendo Wii!